Hi everyone! Today's a look with zigzag pattern, I wanted to try something new with tape. Also my nails were a bit shorter than usual so I was looking for a vertical pattern to make them look longer. 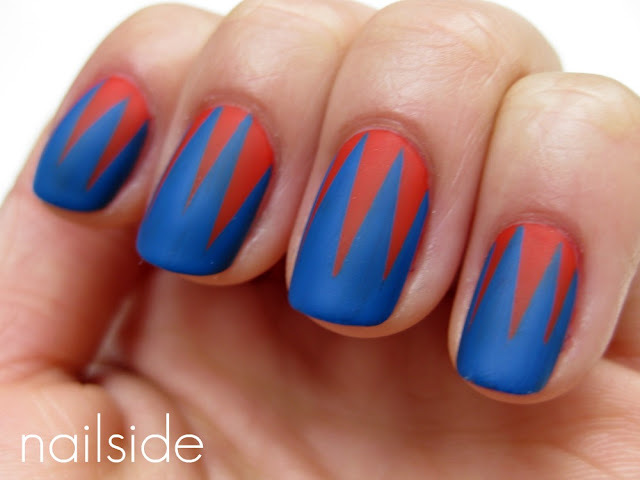 And that's how the zigzag tape mani was born. Though this design might look a bit complicated, it actually looks a lot harder to make than it really is. First I applied a red creme from DA, a local drugstore. After it dried I placed triangles cut out from tape on my nails. On top went Barry M's Cobalt Blue and then Matt topcoat from Essence. Now here's what makes this look easy to achieve: cutting the triangles doesn't need a lot of precision, it's okay when some are smaller or larger than others, different sized wedges make the design playful. And because the tape's placed at the beginning of the nail, you polish away from the tape which reduces the chance of 'bleeding'. This look is all about the pattern so I used a matte topcoat instead of a glossy one to bring out the design better. That looks awesome! It almost looks like something out of a comic book...it'd be perfect with the MAC Wonder Woman polishes. this looks like Ms. Pacman took a bite. love it! !